Description: Fairmount College students and faculty pose on front steps of Fairmount Hall, located on northeast corner of North Hillside Street and East 17th Street, in September 1895. 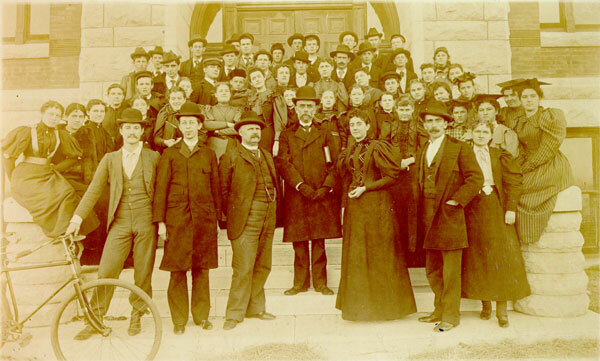 Dr. Nathan J. Morrison, first president of school, is at center. Fairmount College, founded in 1895, is now Wichita State University. Keywords: Wichita, education, people, Wichita State University. 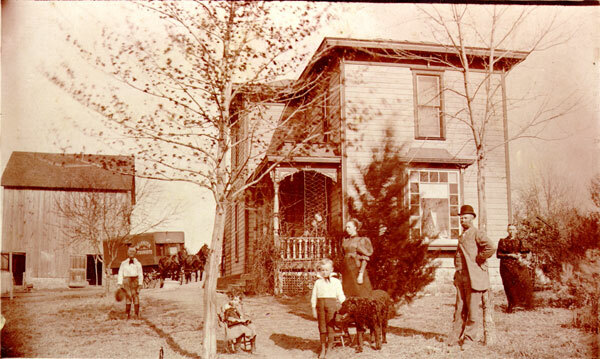 Description: Home of Jones and family on Magic Hill, corner of Grand Avenue and Hillside Street. Horse-drawn Wichita Tourists bus in background. Photograph taken April 12, 1895. Keywords: Wichita, residences, people, transportation, business and industry, W. B. Jones, women, children, Magic Hill, buses, wagons, horses, barns, dogs. 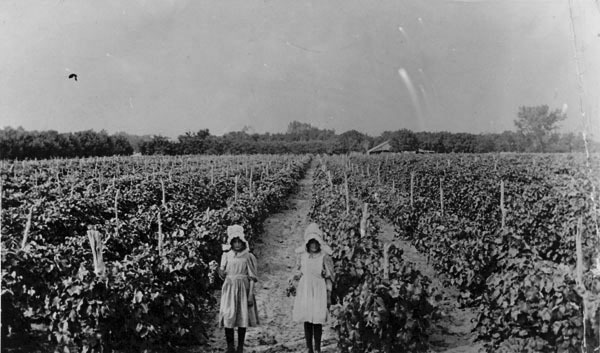 Description: View of Henry Schweiter's 26-acre vineyard at Lincoln and Hydraulic, located north of Linwood Park. Daughters Carrie and Lillie show off grapes. Keywords: Wichita, agriculture, people, vineyards, children. 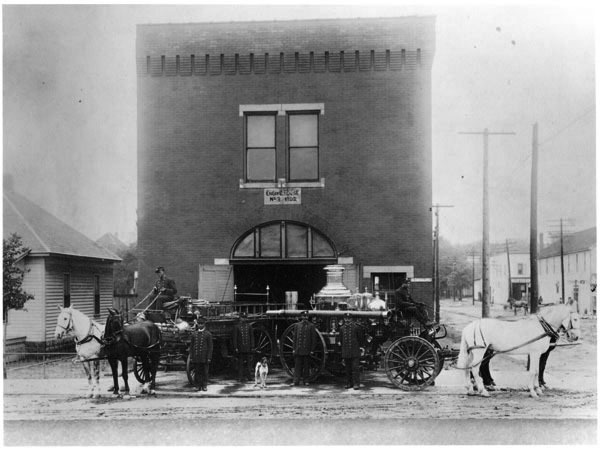 Description: Syl Anderson, Frank Hill, C. A. Glover, Walter Robinson, W. H. Jones and William Whitted pose with their horse-drawn fire engines in front of Engine House No. 3 at East 18th Street and North Topeka Avenue. Keywords: Wichita, public services, transportation, firemen, fire station, fire engines, horses, African Americans, dogs, North End. 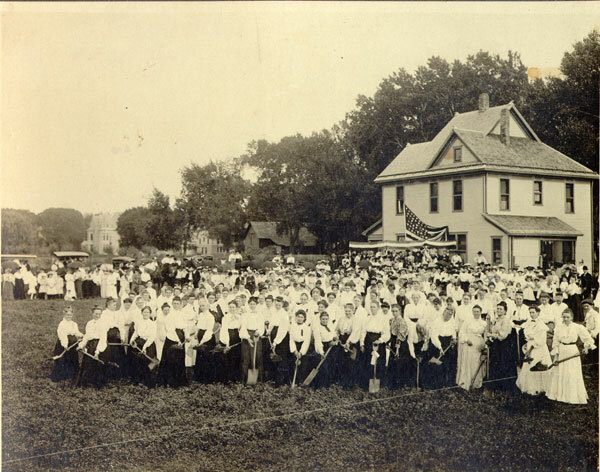 Description: Groundbreaking by 180 members of the Ladies Aid Society of Trinity Methodist Episcopal Church. This church is located at the southwest corner of Maple Street and Martinson Avenue. Photograph taken September 23, 1905. Keywords: Wichita, religion, people, women, churches. Description: View of office, loading dock, plant and employees of Steffen-Bretch Ice and Ice Cream Company. These buildings were located at 623 East 1st Street, just three blocks south and west of Steffen's current site at 700 East Central Avenue. Keywords: Wichita, business and industry, people. 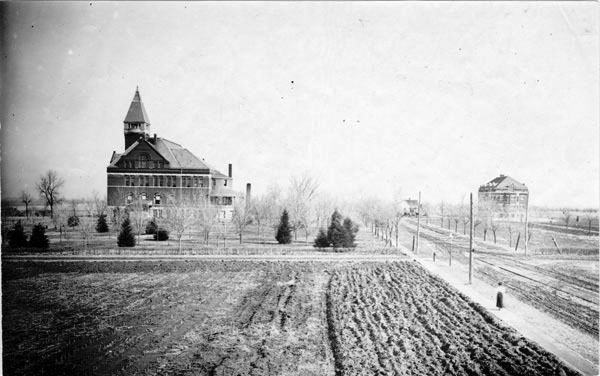 Description: View looking north toward Fairmount College campus (now Wichita State University). Shows Fairmount Hall and Fiske Hall. East 17th Street and Fairmount Avenue intersect at right center. Keywords: Wichita, education, street scenes, schools, Fairmount College. Description: View of J. S. Liggett's Livery Stable at 128 South Main Street after May 8, 1908 fire. Sayres & Claggett Dairy Company wagon parked in front. Shows variety of advertising signs on building. 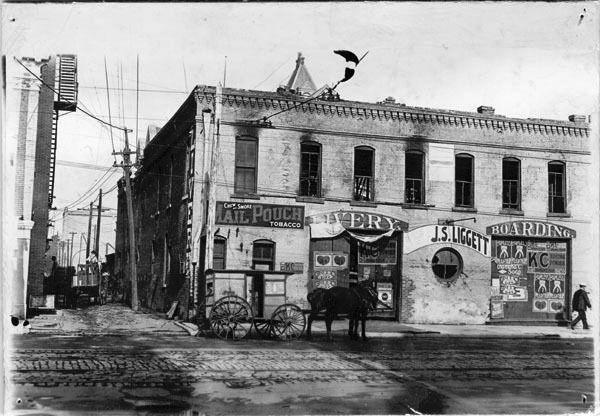 Keywords: Wichita, business and industry, street scenes, transportation, wagons, horses, advertising, fire damage. Description: View looking northwest toward Masonic Building, commonly known as the Scottish Rite Temple. Located at the northwest corner of 1st street and Topeka Avenue, structure was designed by Wichita architects Proudfoot and Bird in 1886 as a YMCA. The Masons acquired it in late 1890s. Addition along Topeka Avenue with decorative detail over windows was designed by Wichita architect C. W. Terry and completed in 1908. Keywords: Wichita; organizations, clubs and groups; buildings. Description: Newsboys pose with the day's copies of the Wichita Eagle newspaper in the midst of busy circulation department. Photograph was taken June 1, 1908. Image was owned by Sidney D. Long, circulation manager of the Eagle.